When you decide to walk around the aristocratic village of Pyrgos, don’t forget to visit an original exhibition. 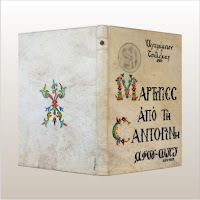 Book lovers can admire the unique creations concerning Santorini which are presented by ARA (Friends of Bookbinding Art) and are of special aesthetic value. ARA have been promoting and projecting the bookbinding art as a means of artistic expression for several years.